Not many monuments in Florence have a strange history as the Loggia del Pesce. The building has been disassembled and reassembled in a different place, and today, finally, it has been restored and shows all its beauty again. In 1565, the face of the city is changing: Cosimo de Medici and Giorgio Vasari are renovating the area close to Palazzo Vecchio with the construction of the Uffizi, and now the architect needs space to build the Vasari Corridor. The fish market, at that time, was on the Lungarno Degli Archibusieri, right where Vasari planned to build the arches sustaining his corridor. It was necessary to find a new location for the fish market, possibly without disappointing the fish sellers: Cosimo was still in the process of consolidating his power and didn’t want to have a strong opposition, not now that he was building his safe passageway. Since the grocery market was already active in the area that today is Piazza Della Repubblica Cosimo thought that maybe the best way to make the fish market operators happy was to build a loggia to cover the market, exactly in the most commercially strategic place. Vasari took care of the design, building a beautiful loggia with glazed terracotta decorations showing fishes and, of course, the coat of arms of the Medici family. 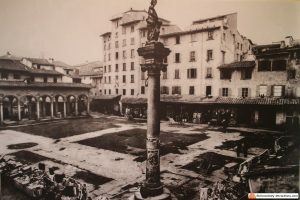 With the reunification of Italy, Florence became the capital of the Kingdom and the renovation of the city center included the area of the market. The Loggia del Pesce was not destroyed though: it was disassembled in parts that were stored in the San Marco Museum. 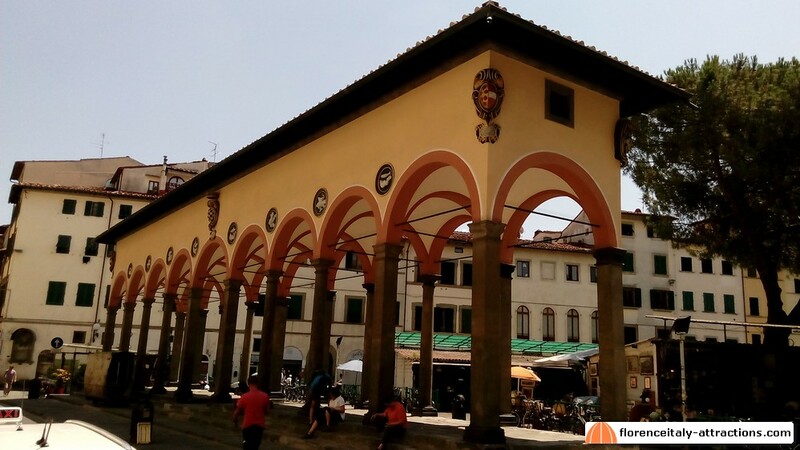 Only in 1955, it was decided to rebuild the Loggia, but in a different location, Piazza dei Ciompi, in the district of Santa Croce. Now, sixty years later, the Municipality restored the Loggia del Pesce, which is now shining in all its beauty, in a place where a famous artist like Lorenzo Ghiberti had his workshop, and very close to the church of Sant’Ambrogio, another hidden masterpiece of Renaissance City. Right behind the Loggia you can find one of the nicest markets in Florence, the Mercato dei Ciompi, great place to buy antiques but also a place where you can find many artisans producing fine pieces of furniture. Close to the Piazza you can also find the Sant’Ambrogio market, the second most important in Florence, where you can buy fresh groceries and typical products.